Striped walls are one innovative way to add charming accents to your living rooms and one must not refrain from trying out various striped wall ideas to bring some positive changes to the interiors. Stripes are an all time favorite of mine as I have a whole section of my living room that has been designed with bright yellow and white stripes all over the walls. Wall designing is as important a task as any other and has to be done up in a proper way. Striped walls bring elegance and beauty to a home. Moreover, striped walls are in vogue this season with many folks going the bolder way by painting their walls with colorful striped wall accents. Come take a look at the post that will show you the top 15 striped wall ideas to decorate your living spaces. The pink themed living room in the image looks feminine and very elegant with pink striped walls. These strips add a gentle touch to the decor that appears quite attractive. The striped wallpaper has been used to lend a cool look to the room whose beauty seems to magnify, courtesy the feminine furniture and other accessories placed. I think black and white stripes look grand when combined together as these bring out a great contrasting effect and also lend a touch of sophistication to any decor. 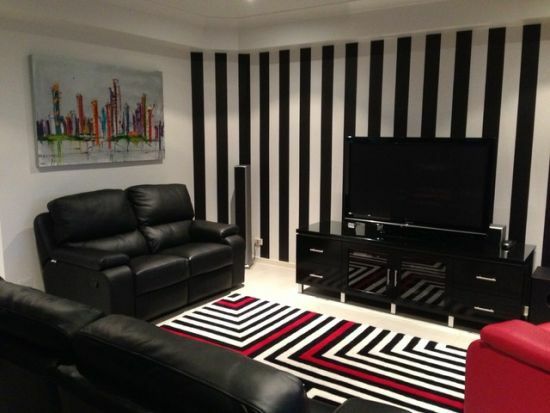 The living room here looks smart and very chic with its walls being designed with black and white vertical stripes. A true artist must have thought about this innovative wall decoration idea when she decided to paint the walls of her living room using myriad colors all by herself. The wall, instead of been painted with full stripes, only the middle part of it has been painted with colorful stripes in a very attractive design. The whole look generated by these stripes is that of gorgeousness. 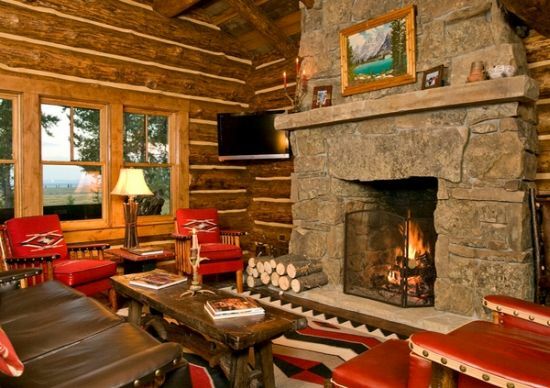 Rustic designs look very fine and add a touch of old world charm to any decor. The living room’s wooden walls have been designed with grey, brown and light orange colored stripes by making use of templates. The look added by these stripes breaks the monotony set in by the brown shades. These stripes match well with the leather brown couches. There isn’t any color as grand and cool as the shade of white. White stripes as seen below make the decor of the living area look bright and very sophisticated. The idea to have white striped walls was to keep everything simple yet classy. The white stripes gel nicely with other features and colors used all over the room. With beautiful laminated wooden flooring and a section of the walls being designed with rust and white stripes, the living area looks eclectic and mind blowing. 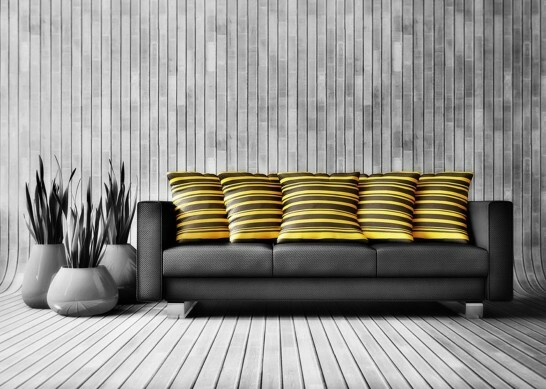 Though there are other charming accessories like a leather lounger in black and trendy sofa, the feature to catch your attention is the striped wall that has hints of glitter all over it. 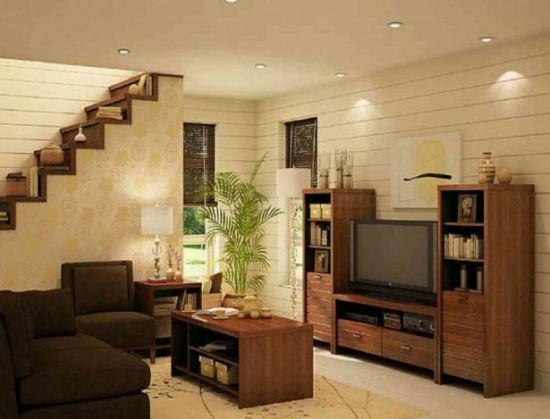 The living room in the picture sets a trend in having the most stylish of all accessories and wall decor. What catches your attention is the white wall just in front of the seating area that has been glorified by adding colorful vertical stripes all over it. 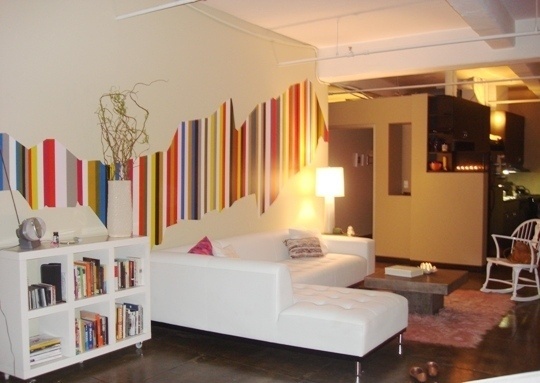 The striped wall makes a strong style statement like no other accessory can! The warm ambiance of this exotic living room seems to appear even more beautiful with the wooden walls decorated with white stripes that have been used as highlighters using templates. 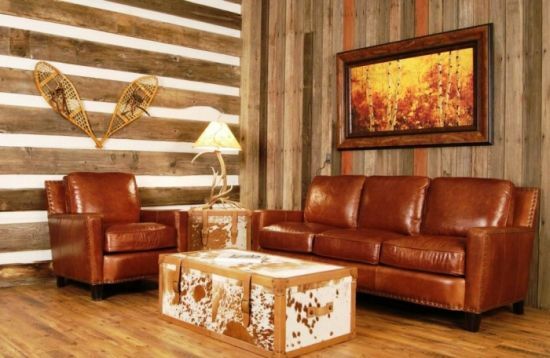 The rest of the furnishings and accessories compliment the amazing wall that looks more like some art work. Vertical stripes, specially in grey tones always add a touch of elegance and chicness to any decor. The walls of this amazing living room are designed with steel grey stripes that match perfectly with the striped wooden flooring, also in the same color. Magenta is one color that can add sparkling touches to any nook and corner of a room. The living room with gorgeous magenta striped wall looks colorful and charges you up with its brightness and beauty. The color combo of white and magenta creates a mesmerizing look for the whole interior. Blue and white is a lethal combo when thinking of wall decoration and this lethal look is successfully generated by this wall of the living room that is designed using beautiful white and blue tones in vertical shape. These colors are soft on the eyes and create an illusion of a bigger space. These stripes also lend a very serene look to the decor. Black is a universally loved color when people think of decorating their homes. Walls too can be given wonderful accents with black stripes coupled with white tones. The contrasting effect created by these two colors creates a dazzling look for the whole room as can be seen in the awesome living area with black leather couches and a trendy rug. Softer tones add coolness to a decor and make it appear composed where one can have some peaceful time, relaxing and rebounding. The striped wall here combines colors like blue, brown and white that mix well with each other and create a soothing feel. The horizontal stripes make the room look bigger and very airy and these compliment the brown colored couch and other furnishings. What a charming room that looks gorgeous from every corner! 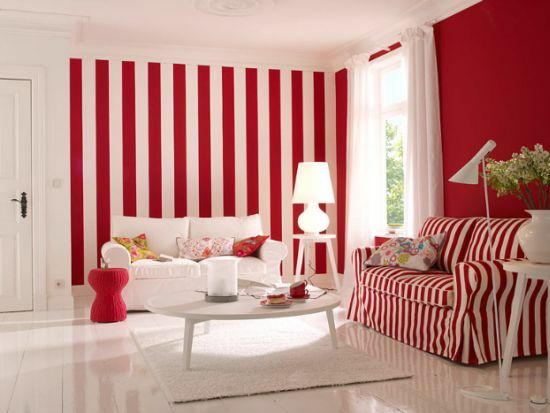 While one wall in the room is painted using bold red, the other is striped using both red and white tones in vertical design. Red goes well with white and both compliment each other like no other color. 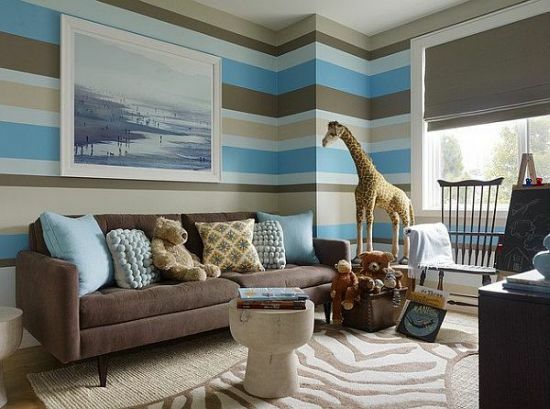 These stripes seem to speak volumes about the owner’s sense of style and ….well….hats off for creating such a wonderfully designed room! 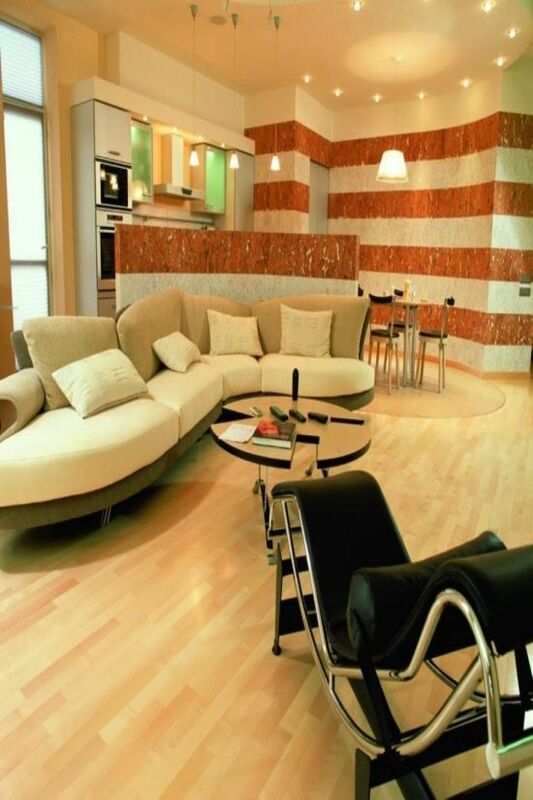 A very unique combination can be seen on the wall of this colorful living area as instead of the ordinary black, white and red stripes, the designer has thought about trying some unusual striped patterns on the walls. 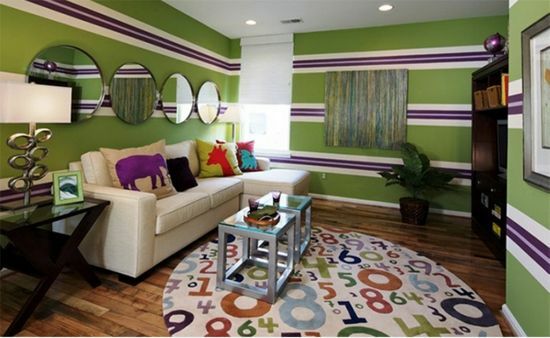 The purple and white stripes add a funky look for the room decor and spread cheerfulness. On thick white stripes are layered purplish strips that are thinner and look quite stylish. Striped walls have a certain charm about themselves and add a dash of style to a room’s decor. With uniform lines adorning your walls, you start enjoying the symmetrical beauty that other patterns like triangles and circles fail to generate. Look carefully and select one that suits your persona and style.